Olives from this Sicilian cultivar are known as Castelvetrano in the U.S. If you haven't experienced biting into one, it's time to seek out these flavor bombs. The drupes are huge, up to a quarter ounce, and the brightest green after brining. With a small pit and a buttery, perfumed flesh, this olive is incomparable. If you're in the Bay Area, go to Berkeley Bowl for your Castelvetrano fix. The oil is likewise remarkable, with a light body and a rosy fragrance. The Nocellara del Belice tree has a wide crown, medium height to about 20' and produces heavily. Disease resistant, especially when grown in fertile soils with adequate moisture. Will have higher yields with a pollenizer such as Pendolino. 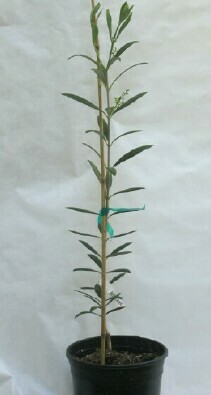 Grown in 1 gal pots, these young trees as of February 2019 are slightly larger than photo, about 2' tall, narrow caliper less than pencil width, some branching. Fragile new growth, so treat with care. Can remain in existing pot for the season. OUT OF STOCK UNTIL LATE SPRING 2019.